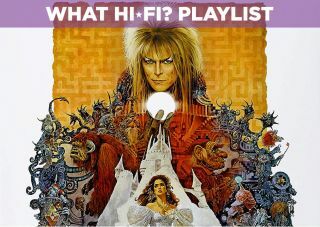 Labyrinth - 4K Ultra HD Blu-ray review | What Hi-Fi? It's been over 30 years since Jim Henson's Labyrinth hit our cinemas, but can the 4K HDR treatment breathe new life into the fantasy cult classic? Sometimes the best ideas come straight after the success of another. That was certainly the case for Muppet creator Jim Henson and fantasy illustrator Brian Froud, who came up with the idea for Labyrinth after the screening of their first collaboration, The Dark Crystal. But Labyrinth wasn’t immediately the success it later became. Despite an impressive list of credits that included the likes of Monty Python scriptwriter Terry Jones, executive producer George Lucas and, of course, the Goblin King himself David Bowie, Labyrinth received a mixed response from critics and a poor return at the box office. Cult classics have a tendency to start out this way (Blade Runner, The Big Lebowski and Donnie Darko to name just a few), and Labyrinth earned its cult status a few years later, with runaway success on home video and later DVD. For the film's 30th Anniversary last year, the studio decided to re-release it on 4K HDR Blu-ray – scanned and mastered in 4K from the original 35mm film negative – with a new Atmos soundtrack included to boot. But can new technology do an old classic justice? You bet. On its surface, Labyrinth is the story of a 15-year-old girl named Sarah (Jennifer Connelly), who goes on a quest to the centre of an unworldly maze, ruled by Jareth the Goblin King (David Bowie), to rescue her kidnapped baby brother Toby. Her journey is helped, hindered and punctuated by Jim Henson's spectacular creatures at every turn, none of whom are done a disservice by the extra resolution at play here. In fact, it's a credit to Henson's work that his creations still look as believable as they did behind the fuzziness of VHS, and in some cases even better. Of course, look deeper than the goblin-filled fantasy world and you'll see Labyrinth is actually a clear coming-of-age tale - the transformation of Sarah from spoiled teenager to young woman; a story of friendship, of family and of trust. It also has a clear moral to the story. Don't ask a Goblin King to take away your little brother in a fit of teenage rage, without being prepared to tackle a 13-hour maze to get him back. Turning an older title into 4K comes with some immediate technical decisions – do you remove the grain that's a part of the film's very being, or not? Thankfully, the decision has been made here to leave it in, and the film is all the better for it. Of course it's not the glossily clean picture you'll have seen on digital 4K films like The Revenant or Life of Pi, but keeping the grain intact not only gives the film its authenticity but also ensures we get to see all the extra detail that's found beneath it. Watching it on one of our favourite AV pairings, the Samsung UE65KS9000 and the Oppo UDP-203 4K Blu-ray player, it's immediately noticeable that lines are more tightly drawn and there is more detail to hand. The furrows on Hoggle's face are deeper and more expressive, the patterned textures of Sir Didymus' clothes are more explicit and Bowie's famously different-coloured eyes are so much more noticeable - something we'd never really spotted before. There’s more depth here too. While this can sometimes give away the occasional painted backdrop, the added dimensionality found elsewhere is worth it. Sets have a much more three-dimensional feel to them, with a better sense of space for characters to move around within them. In one of the final scenes, where Sarah chases Toby around a maze of topsy-turvy staircases, there has never been a more tangible feeling of space and distance between them. Outlines look crisper too. You won’t spot too many puppet strings, but those that are noticeable are easily accommodated thanks to the extra detail found elsewhere. Take the scene with the dancing Fireys, when strings are perhaps their most visible. The addition of HDR really helps to distract your attention, bringing an added depth of colour to the Fireys’ fur that grabs your focus instead. You’ll spot these bolder colours elsewhere too – in Ludo’s fur, in the multi-coloured armour of the castle guards and the blue hair tufts of the “‘Ello” Worm. It gives any bit of colour set against the Labyrinth’s otherwise muted colour palette added punch and impact. That said, HDR comes most fully into its own in the darker scenes of the movie, where contrast is much improved. Not only are blacks deeper, but they’re more detailed too. The tunnel scene where Sarah faces The Cleaner offers up much more subtlety than we’ve seen before, and the sunlight that pushes through the tunnel’s cracks and openings does a starker job of breaking up the murkiness, picking out more detail from The Cleaner’s whirling blades in the process. It’s not just the picture that’s been given an uplift – the audio has been boosted too. Systems that support Dolby Atmos will hear new height from the soundtrack (hearing Bowie’s songs from new angles can only be a good thing in our book), while those that don’t will have Dolby TrueHD 7.1 to play with (up from TrueHD 5.1 on the regular Blu-ray release). Of course, the sound wasn’t originally produced with Atmos in mind, but its inclusion is more than welcome here, even if it isn’t as immersive as one recorded in Atmos from the get-go. Watching a movie you’ve seen hundreds of times and picking out things you’d never noticed before is not something that happens every day. But in its 4K HDR guise, we find ourselves doing so with Labyrinth in almost every scene that passes. While retaining all of its original charm, Labyrinth in 4K manages to deliver new levels of detail, depth, colour and contrast, previously trapped behind the limitations of technology. Those not so keen on grain may prefer the more filmic Blu-ray version but, as suckers for subtlety, we’re happy to take everything that we can get – grain and all. If you’ve never seen Labyrinth, there’s no doubt you should make this the disc with which to right your wrongs. If you loved it as much as us, you really owe it to yourself to watch it in 4K. And if you’re anything like us, you’ll watch it all over again straight after. The Ultra HD Blu-ray features an audio commentary by costume designer Brian Froud, which was also featured on the 2009 Blu-ray release.